The movie The Thin Red Line tells the story of the battle of Guadalcanal. However, the way the battle was depicted in this movie is far from how it really happened. The movie produced in 1998, told more of a love story than of actual historical content of the battle. Throughout the movie, the Allies are trying to take over hills on the island. Most battles shown in the film are fought during the day. Also, almost all of these battles are fought in open grassland areas and topography. Very seldom were American soldiers killed in this movie. The Thin Red Line Movie Poster. 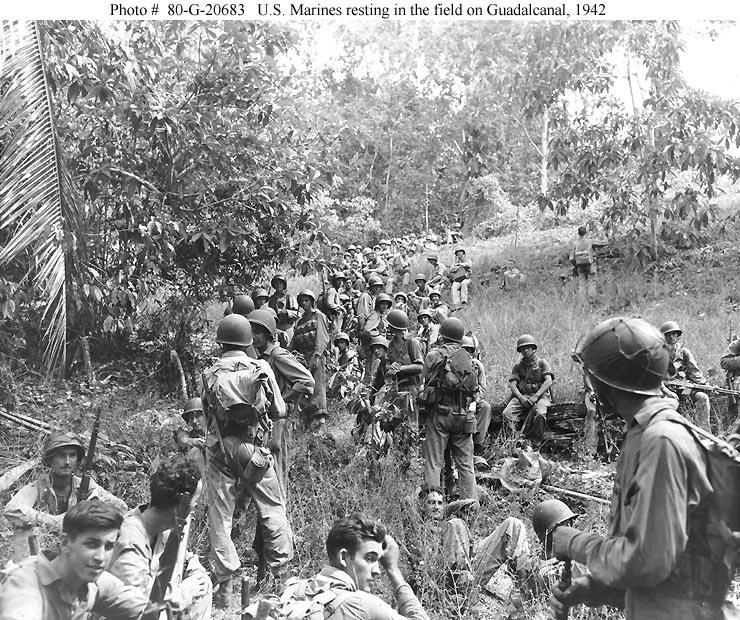 The real battle of Guadalcanal took place from August 7th 1942 to February 8th 1943. During this campaign, most battles were surprise attacks fought during the night in wave formation or guerilla sneak attacks. This means that the marines were almost always caught off guard, which led to mass paranoia. Many of these battles were fought in dense jungle areas and swampy wetlands. weather conditions were harsh involving hot temperatures close to 110 degrees and torrential downpours. many marine's were fatigued and had very little food rations. very prestigious war heroes came out of the pacific theater like John Basilone who fought at Guadalcanal. Basilone was awarded the navy cross and the medal of honor for his actions on Guadalcanal. Compare and Contrast between "Reel" and "Real"
There are many differences between what happened in The Thin Red Line and what really happened in the real battle of Guadalcanal. For instance, in the film most of the fighting takes place during the day. In the actual battle, most of the fighting was done in the cover of darkness. This allowed the Japanese and the Allies to hide from each other with better cover. Another difference is that in the movie, most of the battles take place in open tall grass on hills throughout the island. In the real battle, the fighting was done mostly in the thick jungle on the island. The Japanese used this to their advantage, using guerilla tactics to attack Allied troops. Also, in the movie there was barely any American casualties. This does not hold true in the real battle when there was nearly 1,600 American soldiers killed, countless injured, and thousands that died from tropic diseases such as malaria. Finally, In The Thin Red Line, the Japanese were depicted as a weak, terrified enemy. In the real battle of Guadalcanal, the Japanese were fierce enemies who fought to the death without hesitation. They were not scared and they were respected by the Americans. "Guadalcanal Campaign." Wikipedia. Wikimedia Foundation, 11 Dec. 2013. Online. Encyclopedia Britannica, n.d. Web. 12 Nov. 2013.